Designing a watershape to complement a dynamic fountain sculpture is mostly about viewpoints, writes Brian Van Bower. But fitting it into the context of a larger and equally vibrant entertainment space? As he discusses here, that calls for thinking theatrically as well. Through the years, I’ve come across all sorts of clients with unique motivations and interesting available spaces. My task in collaborating with each of them centers on carefully evaluating the situation, sorting through various sets of possibilities and, ultimately, delivering a design that hits the mark on all possible levels. 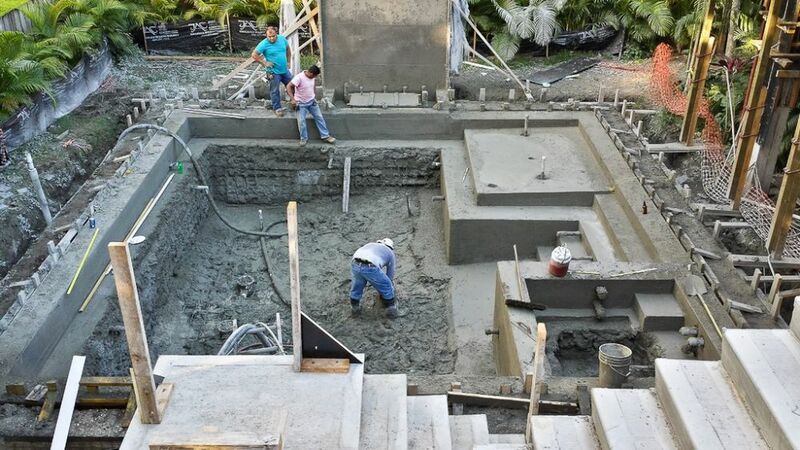 This project, however, was a bit different from most: The client had acquired a large sculpture, he said, and his main desire was to get a pool to go with it. 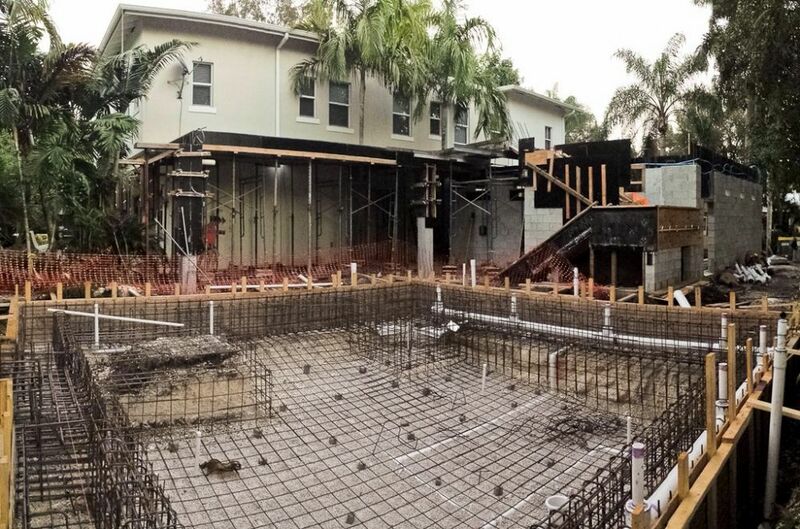 In our preliminary conversations, I also learned that he had purchased adjoining lots in the Coconut Grove district of Miami, and one of them – the one we were called to as designers – was to become a studio/entertainment space featuring the sculpture, a pool and generous spaces for social gatherings. The yard was on the small side, but given its intended use, it was perfectly adequate. Our challenge at the Miami-based design firm of Aquatic Consultants came in controlling a considerable flow of ideas and creating a space that harmonized with the sculpture’s grace and elegance. The sculpture in question had a lot going for it, with sweeping lines, substantial vertical energy and a certain writhing sensuality, so we approached the overall design with the idea of setting a stage for it. To frame the composition and pull it forward, we placed a weeping wall behind the figures, canting the surface back just a little from the vertical so the water ripples down the tile surface. The sculpture itself is a fountain, with water flowing from the bowl-like top of the structure and down to the basin below. Despite appearances, the fountain has its own circulation system. 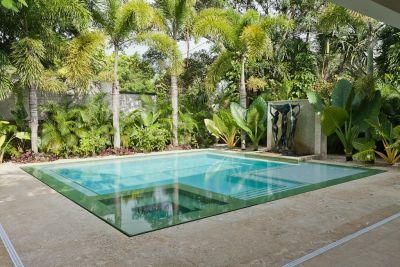 As completed by Regency Pool & Spa of Plantation, Fla., which installed all of the watershapes to our design specifications, water from the fountain and the weeping wall flow onto black pebbles at the base of the sculpture before passing through a perforated stainless steel grate and into an isolated vault. 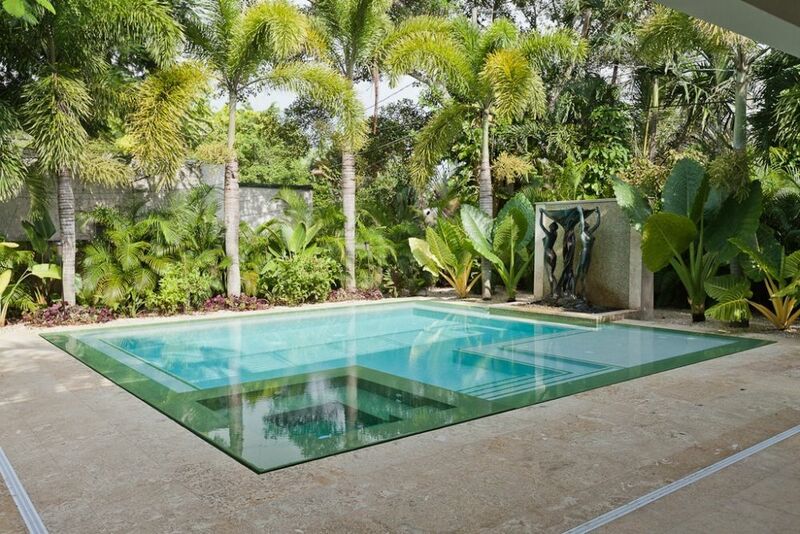 Nonetheless, there’s an illusion that it’s all one system and that the sculpture essentially floats on the pool’s surface. 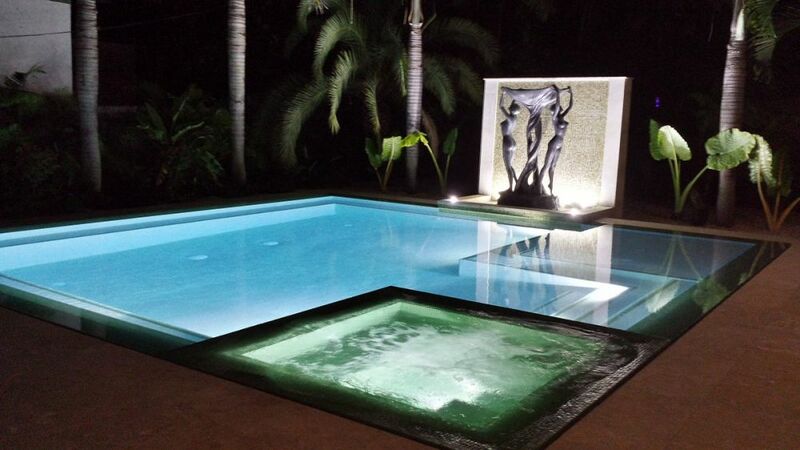 Given the client’s desire for an entertaining atmosphere, we highlighted the setting at night by inserting LED lights into the basin, where they serve the dual purpose of bathing the sculpture in light while also enhancing the glistening flow on the weeping wall once the sun goes down. As for the pool in the foreground, we wanted its reflections of the “stage” to be seen from as many angles as possible in the backyard. We also wanted its lines to be both simple and elegant – a suitable foil for the sculpture’s swirling energy. The choice in this case was a 26-foot square watershape with the sculpture’s basin stepping just over the structural line on the far side of the shell. The all-tile spa fits neatly within the margins of the square. To isolate it for functional purposes, we raised its level by a quarter-inch above the pool’s surface and the level of the perimeter-overflow edge around the rest of the watershape. The hot-water experience includes four therapy stations – again, a slice of simple elegance. The key to this design – and to the landscaping that surrounds it, although we had nothing to do with it – is restraint. 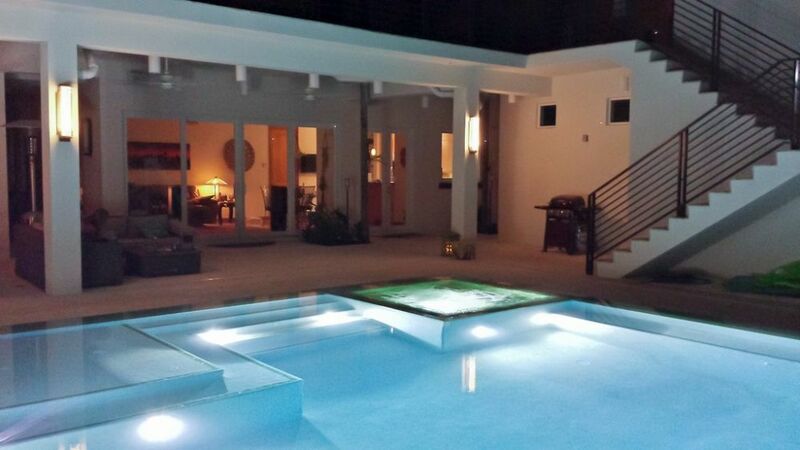 Given the homeowner’s desire to make the pool both a showplace for his prized sculpture as well as a full-featured entertainment space, we could have been carried in a range of wild directions to bring the backyard’s fun, social side into focus. These are cases in which, as designers, we need to pull homeowners back from the brink and get them to consider a fuller picture. In this case, for example, we held onto our focus on tasteful elegance and kept doubling back to the sculpture and the water’s reflective potential whenever talk of additions such as fountain jets or other distractions arose in our conversations. 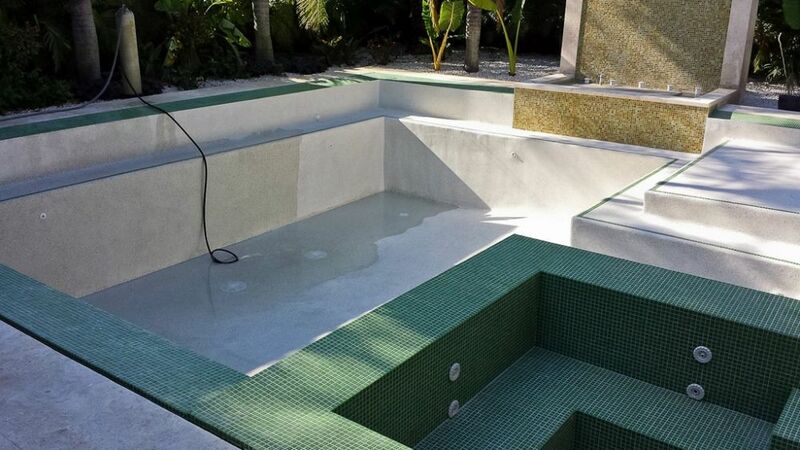 But don’t get me wrong: This is a full-featured pool by most standards, with an all-tile spa, a lounging shelf (or, as we refer to them in our office, an SLA), full-perimeter benches, lots of colorful tile details and a perimeter-overflow system included. But none of these features affects the mirror surface of the water near the sculpture or distracts from the atmosphere of elegance the owner had wanted from the start. In appearance, this seems a modest project. In reality, however, it’s an elaborate gem that gets prettier every time you see it.